A lovely, trip up a solid trail to cloudy views across the Teanaway. 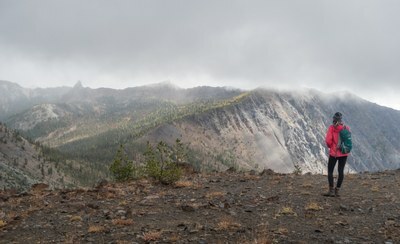 We hiked the trail to the saddle on the shoulder of Iron Peak where it was initially foggy, snowing, and a bit windy. Conditions didn’t seem optimal for continuing on toward the County Line trail, so we walked up the good boot path to Iron Peak and enjoyed even more blustery wind. As we ate lunch at the saddle the clouds lifted a bit and we could see larch in the distant basin just starting to get a hint of yellow.